Big names join us at Exeter University to answer questions on Brexit/what we do now! 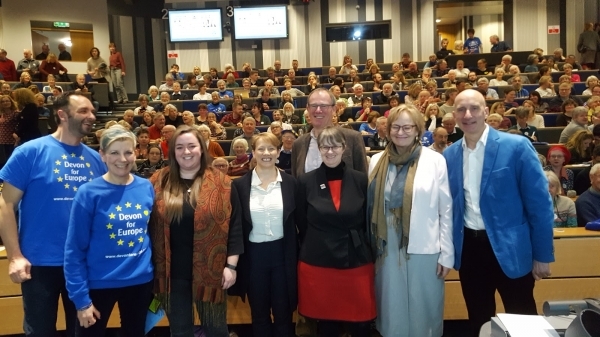 Over 370 supporters from all over Devon and beyond, crammed into the Peter Chalk Centre at the University of Exeter on Sunday afternoon to hear a seasoned cross party panel give their views on where we are now with Brexit and to answer questions from the audience. The keynote speaker, Lord Andrew Adonis, reminded the audience, to much cheering, that the European Union was the greatest and most successful peace and prosperity project in the history of Europe. He emphasised that cross party agreement is vital to the success of the campaign for a People’s Vote. He also stressed that the peace process in Northern Ireland must not be put at risk by the reimposition of the dangerous and divisive border - inevitable under May’s/any deal or a disastrous No Deal. He also highlighted the hypocrisy of prominent Brexiteers, like Farage, who secured German passports for his children recently to ensure that they would not be stripped of their freedom of movement, unlike the the rest of the UK’s citizens. Concluding his rousing speech, Lord Adonis stated that Brexit is now, inevitably, imploding, because Brexit promises were absolutely impossible to deliver. That meant that the only way out now will be to put it back to the people in a referendum. Other speakers were Amanda Chetwynd-Cowieson, from the youth organisation, FFS (For our Future’s Sake), MEPs for the South West and Gibraltar, Julie Girling, Clare Moody and Molly Scott-Cato and finally Lord Teverson (former MEP, now sitting in the Lords). Amanda spoke of the young people she meets as being “disappointed pessimists”, who feel their voices are not being listened to. She felt that young Labour supporters don’t understand why Labour is not reflecting their views, especially given the power young people have with politicians, who are afraid for their future electability. Julie Girling (former Conservative, but now independent MEP), emphasised that the Remain movement must stay resolutely cross-party, focusing on the middle ground, as the main parties head for the extremes. Older, or conflict-weary voters, need to be reassured that revisiting the Brexit decision is perfectly democratic. She stressed that the only way to make Brexit go away is to stop it now. The Withdrawal Agreement is only the start of a long process which means we will be discussing the actual terms for many years to come. Brexit will not go away unless cancelled. Molly Scott Cato (Green MEP), hoped the crisis would enable a change to the political system in the shape of a written constitution, an end to the two party system and an elected House of Lords. She warned that the ‘Norway option’ (or ‘Common Market 2.0’ as it is misleadingly called) has become popular in Westminster and that this was dangerous as it leaves us with a ‘pay for no say and obey’ situation which Brexiters would hate and use as a reason to implement the hardest of Brexits. She appealed to those present to press their MPs to avoid this option. 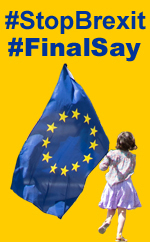 Lord Teverson, a Lib Dem peer, expressed his delight at the numbers of EU flags to be seen outside Parliament every day and commended Devon for Europe for making the effort to get up to London for the Meaningful Vote. He urged us to champion the four freedoms, reminding us all that freedom of movement is reciprocal and of huge benefit to us all. He went on to say that, far from being protectionist, the EU’s single market and trade deals with Japan, Canada etc (which we will forfeit if we leave) were all about freedoms, not restrictions. Parliament has begun to take control of the process - essential as we effectively have no Prime Minister. The cabinet may disintegrate and it is possible a General Election may happen. Our unwritten constitution makes the current situation complicated and hard to predict. The media has been lying for decades and there is no easy way to stop it. It might be possible to get a public enquiry into the BBC, which fails to call out lies and consistently confuses balance and false equivalence. Every time lies go unchallenged, people should write and complain. Many toxic comments on social media are from Russian and US-funded Far Right troll farms. More power and funding needs to be devolved to local government (as it is in France and Germany). Lord Adonis felt it would also be good to have a polling station at every place of education. It was essential that the vote take place in term time. The UK has been a leading light in the development and direction of the EU. It would be a tragedy to lose that power and influence for no domestic advantage. Better to remain and help to continue the process of reform. Rounding up the debate, Lord Adonis congratulated Devon for Europe and commented that it was now almost certainly the largest political organisation in the county and the largest pro-active, pro-Remain group he had visited in all his travels meeting similar groups around the country.